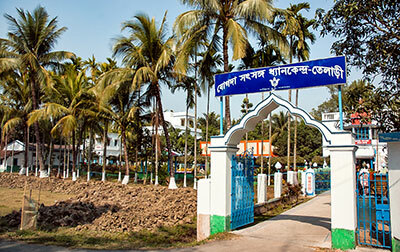 The history of YSS activities in Telary dates back to 1970s when some Yogoda devotees expressed an interest that YSS explore the possibility of spreading the name of Paramahansa Yogananda in the district of South 24 Pargans in West Bengal and accordingly invited YSS to visit the village of Telary in the said district. YSS started humanitarian activities at Telary by opening a homeopathic dispensary. Appreciating the enthusiasm of the villagers, YSS in 1973 conducted a Hong Sau technique class for the benefit of a small number of interested local devotees. Gradually as more and more villagers enrolled for YSS Lessons, Gurudeva’s Janmotsav, became an annual feature in the village. With the donation of a small piece of land by an enthusiastic villager, YSS constructed a building to serve as a homeopathic dispensary and a small meditation hall.During Guruji’s birth centenary in 1992, YSS started an allopathic dispensary—with three doctors by turns. A pathological laboratory with instruments worth Rs.1 lakh greatly helped the local day laborers who had otherwise to lose days of labour, to go to the city to have their tests done. YSS welfare activities in the village drew appreciation of local authorities and like-minded people around. A prominent business man offered his large property to support the YSS humanitarian activities in Telary. Interest and enthusiasm of the villagers prompted YSS to consider starting a more viable center in the village. Accordingly YSS purchased some adjacent plots of land, and initiated further constructions. Gradually, Gurudeva’s Janmotsav program began to be conducted in a more elaborate fashion which included a prabhat feri, followed by a whole day program with satsangas, review of meditation techniques, and group meditations conducted by YSS monastics. 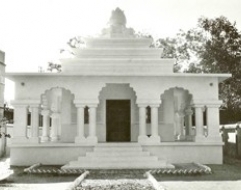 With its ideal location on the eastern bank of the sacred Ganges, and an exquisitely maintained garden with variegated flowering plants and a pond within the property, and with kitchen facilities available, the place also started to function as a retreat center from 2003. 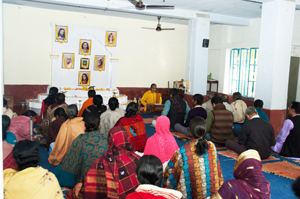 Two or three day retreat programmes—which include satsanga, review of meditation techniques and energization exercises—conducted by YSS sannyasis each year became a popular event among devotees from Kolkata and neighbouring areas. A charitable coaching center—running from 7am to 9 am on week days--was started to help the local students. Presently around 60 students are provided coaching by four teachers, as per the academic curriculum. The students are also familiarized with the “How-to-Live” principles of Gurudeva. Every Sunday, about 100 children of the locality attend Children Sunday Satsanga program conducted by some experienced YSS devotees under the guidance of YSS monastics. Special classes—from 12:30 pm to 2:00 pm—in Spoken English and Elementary Mathematics are also held every Sunday and students are provided with lunch before the commencement of the classes. YSS also organizes inter-school programs at Telary during International Yoga day and Janmotsav celebrations. Other than talks and interactive classes by YSS monastics the programs also include quiz competition on Autobiography of a Yogi, poetry, elocution and story-telling contests. The students also enthusiastically participate in the meditation and chanting. In 2015, around 450 students from 14 schools participated in these programs. At present, the homeopathic clinic is run by three doctors and is open from Monday to Saturday. The clinic serves an average of 200 patients every day. The pathology laboratory conducts several tests - blood, ECG, etc. The medical services also include a physiotherapy center to help the mobility and functional ability of patients. The allopathic dispensary is visited by around 30-40 patients every day from the surrounding villages. The entire centre is vibrant with active programs with guidance and inspiration from YSS monastics, and dedicated work by about 14 staff under the supervision of local devotees, eager to make the place an ideal area of service and meditation as per the ideals of Gurudeva. The best option to reach Telary is to come to Dakshineswar Ashram and from there take the help of the ashram reception to hire a taxi directly to the retreat. The distance is around 56 Kms. If the traffic is not much, the total duration of the journey should be within two and half hours. Local trains are available from Sealdah railway station (located in the heart of Kolkata city) to Budge Budge (1 hour journey) from where Telary is 15 Kms. One can hire auto from there to reach the retreat. From Howrah railway station one can go to ‘Babughat’ (on the other side of the Ganges) by availing ferry service. Bus (route no. 75) services can be availed from ‘Babughat’ bus stand to ‘Raipur’ (a journey of around 1 and half hour) from where Telary is a 3 Kms journey for which one can hire an auto to the retreat.